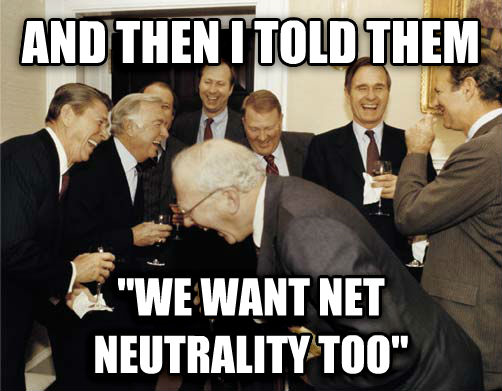 You've probably been hearing a whole lot of hoopla around the Internet in regards to Net Neutrality. If you're not familiar with this fight you've probably been living under a rock since 2010. You see, Net Neutrality has a lot of people clamoring to be heard, and the FCC is trying to convey the human emotion of sympathy. So what does Net Neutrality mean to you? First, let's give a little bit of history. In 2010, the FCC told big ISPs (Internet Service Providers) like Verizon and Comcast to abide by the philosophy of Net Neutrality. Meaning that ISP network management must be transparent, and they cannot block, suppress or discriminate against (lawful) websites or traffic types on the Internet. Which basically means that all ISPs have to treat all of the content you access on the Internet equally. As a user of the Internet-you want this. The reason the Internet is so wonderful is because it gives everyone an even playing field. The Internet has given start-ups, activists and artists a place to showcase their talents in an accessible and exciting way. If Net Neutrality is abolished-then we're looking at an entirely different Internet all together. Now this is where the buzz kill starts. Earlier this year, former cable industry lobbyist and now FCC Chairman, Tom Wheeler ignored the rules of Net Neutrality by allowing companies like	Netflix to pay ISPs to stream their videos and other content more quickly on an internet "fast lane." What's so bad about that? I can watch House of Cards faster! Silence fool! This is the beginning of the end of the Internet as we know it! Think about it, if the Internet were divided into "fast lanes" and "slow lanes"… who do you think would benefit the most? Well that's the fear anyway. FCC criticizers have cited a number of reasons why splitting the Internet into two lanes could mean big problems for the World Wide Web as we know it. If ISPs grant companies like Hulu and Netflix the ability to access faster lanes at higher price, the fear is that the little guy will eventually get shut out. If Net Neutrality is dismantled the Internet will become a two-lane highway with a "dirt road" and a "spick and span clean toll road" where websites with deep pockets will have smooth sailing, while the rest of the poor shmucks will be relegated onto the dirt road. Even worse, ISPs could start charging customers to see certain sites. This could lead to ISPs favoring certain big sites-- *cough*	Fox News *cough* Facebook. In the future, you could be offered "discount" broadband that will only allow access to a small number of curated sites. If ISPs successfully force website owners pay for faster load times, tiny retailers and personal websites will be the ones who will suffer. As you can imagine, January's decision caused a lot of uproar online. On Thursday, Tom Wheeler presented a revised proposal and assured the public that the FCC isn't gutting open Internet. "There are reports that the FCC is gutting the Open Internet rule. They are flat out wrong. Tomorrow we will circulate to the Commission a new Open Internet proposal that will restore the concepts of net neutrality consistent with the court's ruling in January. There is no 'turnaround in policy.' The same rules will apply to all Internet content. As with the original Open Internet rules, and consistent with the court's decision, behavior that harms consumers or competition will not be permitted." Thursday's meeting presented the revised proposal that would aim to stop large ISPs from brokering deals with content companies on special terms, and would seek comment on whether "paid prioritization" should be banned. Wheeler is essentially trying to convince the public that it's possible to have Internet "fast lanes" without creating any slow ones. Wheeler's revised rules also call for tough supervision over ISPs that are tempted to engage in monopolistic behavior. On Thursday, the FCC voted 3-2 to allow a "public consultation" over the next four months. What could they possibly have to talk about for four months? Well, a few things. First, there is the debate as to whether or not to classify broadband as a utility. Making it a utility could lead to stronger regulations like that of telecommunications. Right now ISPs are	classified as information services, and if it becomes a utility the FCC could hold even stronger regulations. This would mean tighter supervision under Section 706 of the Telecommunications Act of 1996 . Members of big ISPs wrote the FCC a	strongly worded letter on May 13th urging them not to change their designation. The conversations will also touch on those proposed "fast lanes" everyone is so upset about. The FCC's goal is to present this paid prioritization in a way that won't hinder consumer's independence on the Internet, and they're looking for public input to do so. So here's your chance. If you would like to send the FCC one of your own strongly worded letters	you can here. Tell them why Net Neutrality is important to you, and why paid prioritization is a one-way ticket to mogul-ville. John Halka This government sticks it to the people for everything it is a out of control animal that needs to be shot. If they are not making life stink they are not happy power to the people where it belongs and retribution from the people is long overdue. Loco Driver John, did you ever hear of "voting" or sending letters to you representatives? I know - thanks to the Supreme Court, a mega-billion dollar company is now a "person" so the CEO or Board of Directors can hang the power of the corporation over the people who are supposed to be OUR representatives - but it's not time to give up yet. Several weeks ago I voiced my opinion to the FCC - just like the writer of this article suggested. (And she even included a link so you can do the same.) If enough of us "little people" make enough noise, perhaps the FCC will hear us, over the demands of the Corporations, aka "persons." Before demonstrating to everyone that you don't know squat, you might want to understand the issue at hand. It is NOT the government that is causing this problem - it's out-of-control telecom corporations. If you want to be angry about something then be angry about the SCOTUS decision in Citizen's United that purported to create corporate Frankensteins - endowed with human rights but devoid of any other form of humanity. CORPORATIONS stick it to people and you, my friend, are their happy, drooling lapdog. Government isn't perfect but at least there is some accountability with government. There is NO accountability in a corporatocracy - and that is what the US is now - the UC of A - the United Corporations of America. You wanna fight something, fight that.